A History of Modern Italy addresses the question of how Italy’s modern history–from its prolonged process of nation-building in the nineteenth century to the crises of the last two decades–has produced a paradoxical blend of hyper-modernity and traditionalism that sets the country apart in the broader context of Western Europe. Anthony L. Cardoza is a Professor of Modern European History at Loyola University Chicago, with a research specialization in nineteenth and twentieth century Italy and Fascism. He received a B.A. from the University of California, Davis in 1969, and his Ph.D in History from Princeton University in 1975, before accepting a Rome Prize Fellowship to the American Academy in Rome in 1976. He is the author or co-author of five books on Italian history. His Agrarian Elites and Italian Fascism: The Province of Bologna, 1901-1926 (Princeton, 1982), won the 1983 Marraro Prize from the Society for Italian Historical Studies. Aristocrats in Bourgeois Italy: The Piedmontese Nobility 1861-1930 (Cambridge, 1997) was awarded the American Historical Association’s 1998 Marraro Prize for the best book in any area of Italian and Italian-American history. 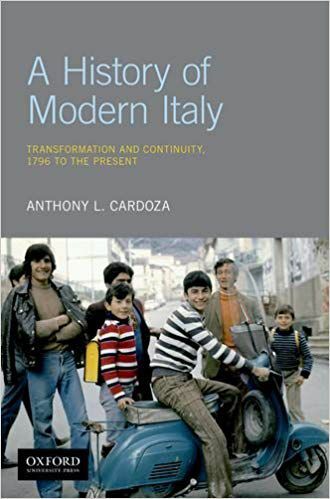 Cardoza is also the author of Benito Mussolini: The First Fascist (Pearson-Longman, 2006) and co-authored with Geoffrey Symcox The History of Turin/La Storia di Torino (Einaudi, 2008), in addition to The History of Modern Italy: Transformation and Continuity (Oxford, 2018). Franco Andreucci has been a professor of contemporary history at the University of Pisa, where he taught from 1976 until his retirement in 2013. He has also been a visiting professor in Barcelona, Marburg, Chicago, as well as a Jean Monnet Fellow at the European University Institute in Florence. His scholarship explores European political history of the nineteenth and twentieth centuries, with particular interests in the fields of the history of socialism, Marxism, and German social democracy. He is the author of several articles and books on these topics, including his latest work, Da Gramsci a Occhetto. Nobiltà e miseria del Partito comunista italiano 1921-1991, Pisa, Della Porta Editori, 2014. Ciao St Louis & St. Ambrose Health and Wellness Fair was a fun and healthy day for all. Today’s Family Heath and Wellness Fair at St. Ambrose on the Hill. We had a great turn out with about 150 people and gave a total of 54 flu and pneumonia vaccines. Visitors also received a number of goodies along with some great advise for a healthier life. Dr. Julie Dunn-Morton is the Curator of Fine Art Collections at the St. Louis Mercantile Library at the University of Missouri-St. Louis. Dr. Dunn-Morton received her B.A. in Art History from the University of Missouri – St. Louis. She completed her M.A. and Ph.D. at the University of Delaware with research on American Neoclassical sculpture and art patronage in St. Louis. After serving as Docent and Tour Programs Manager at the Delaware Art Museum, Julie joined the Mercantile staff in 2002. Here her exhibition credits include Missouri Splendor: St. Louis Artists and the Landscape (2006), Billy O’Donnell: Painting Missouri (2008), One Artist’s Journey: The Life and Work of James Godwin Scott (2009) and Selections from the St. Louis Mercantile Library Art Museum (2015). In 2007 she authored 160 Years of Art at the St. Louis Mercantile Library: A Handbook to the Collections; a revised edition of the handbook is forthcoming in 2021. She continues research for a catalogue raisonné. She continues research for a catalogue raisonné of the works of Frederick Oakes Sylvester. We will be scheduling a special tour of the exhibition at the Library in late October or early November. Watch for more information. classical architecture that surrounded him. This exhibition will display Corrubia’s work while living in St. Louis in the 1930s. His sensitive eye saw the beauty in St. Louis buildings, both old and new, even when their condition reflected the economic hardships of the Depression era. These works reflect both the artistic traditions of Corrubia’s Italian heritage and the aesthetic of his artistic colleagues in St. Louis, where he was an active part of the local and regional art community. specific interest to the Italian-American community, he designed St. Ambrose Church and the Sacred Heart Convent (aka The Villa). Be sure to select ‘EN’ (English) in to top corner of the application once you download. The Ministry of Foreign Affairs and International Cooperation has developed, in cooperation with IED [European Design Institute] and Ovosodo, the “ItaliAmo” app, which offers a free Italian language and culture A1 level course for iOS and Android devices. The course seeks to become a new interactive tool to teach Italian and promote the excellence of Italy’s culture and products abroad. The course, which is available free of charge on Google Play and App Store, is organised in ten steps set in ten Italian cities or regions. It is meant to be a journey to discover Italy along with Leo and Lisa, modern day versions of two famed historical persons, Leonardo da Vinci and the Mona Lisa. Each step is divided into four sections, i.e. dialogue, expressions, exercises and culture. Currently available in English and Chinese, the app will be translated into the major languages by the end of the year. With this app, users may interactively learn the basics of Italian language while discovering the artistic and cultural heritage of our country and the excellence of Made in Italy products. This is a truly cutting edge project in the field of language learning with an innovative graphic design. Click here to visualize the QR code to download the application.